Judaea. Herodian Dynasty. Agrippa I, AD 42 to 43. AE 17. 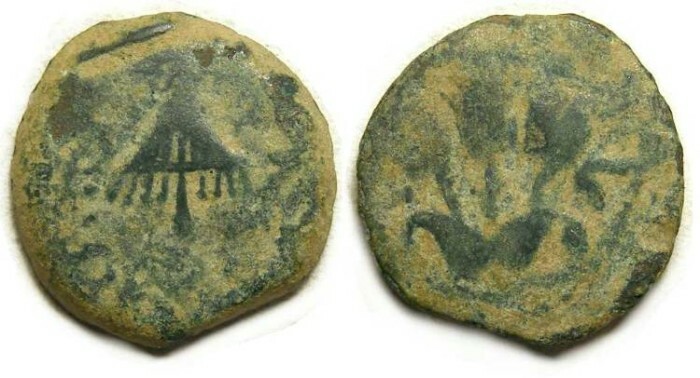 Denomination : AE 17 (probably a Prutah). Date : Year-6, AD 42 to 43. Reference : Sear Greek Imperial - 5567. Size : 16.5 x 16.0 mm. Weight : 2.66 grams. Obverse : Canopy with fringes with BACILEWC AGRIPA around (only fragements of the inscription are visible.). Reverse : Three ears of barley with the date mark L V flanking (L means what follows is a date, and the oddly shaped S is a Greek letter dogma indicaing the number 6).